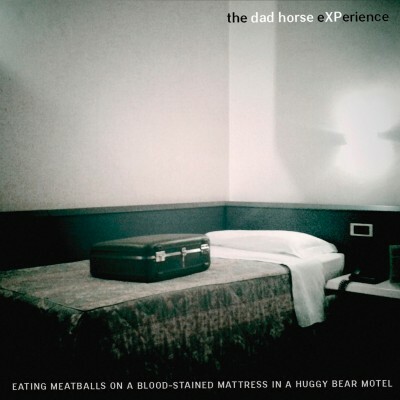 His fifth release in the last decade, Eating Meatballs is a different and darker direction for Dad Horse Ottn. In his last original release, Dead Dog on the Highway, Ottn was exploring the dark recesses of spiritual need and salvation. Macabre songs like “WTC in Heaven” and “Lord Must Fix my Soul” struck up images of Appalachian folk and Southern gospel music. It was a weird but appealing album. The sound walls were still sickly and dank, but the most recent release compounds the darkness into a sullen hovel of humanity. Rife with the tangy stains of tenor banjo and off-tune croons, Ottn captivated my unblinking attention for the entire album. Where Dead Dog on the Highway had a jump and skip, merry-go-dark sound to it, Eating Meatballs drudges and stumbles the listener down a barge of sadness. There are still murmurs of the “Kellar Gospel” in his lyrics, but where there was a cup brimming of spirit sits an empty vessel husking in the wind. The overall orchestration of the album has more strings than his previous albums, but it still sounds distinctly Ottn. The album opens with “Will I Be Someone,” and it lulls the audience into familiarity—it’s bouncy banjo and bass jangle sounds straight out of Ottn’s previous work. It is here that Ottn pulls the rug from under the audience. “Reach Out Your Hand Revisited” is a plea for mercy. The mandolin and Ottn’s vocals stiffen and groan for seven minutes of doleful dirge. This is strewn atop “Rain,” a 17-minute psychotic deliriant, a Grimm’s fairytale being recited with a mouth full of bark and grubs. It feels evil just listening to it. The circular melody and poetic frothing emits for this song, unsettling to the ear. There may be no screaming, no earmashing heavy tones and blast beats, but grindcore has nothing on the intense, blinding blackness I get from “Rain.” Prior to “Rain” is “Under Swine & Bears,” an instrumental and aural mist. The song paints an image of fog and grey Wyoming flatness, the feeling of filth greasing your bodily joints, guitars echoing the grouse vocals. “Huggy Bear Motel” and “Little White Fish” continue the peppery on-off appeal of this album—they are delightfully dark tunes about morbid images juxtaposed with the ridiculous. If you don’t want to see the undercroft of Ottn’s soul, the egesta of human story, stick with these songs. They’re still dark; Ottn still paints a remorseful tune with his footbass and mandolin. Right now, though, I’m not interested in that. I want to see how deep the cellar goes. With Ottn as my Virgil, I want to see the hell he has to preach. Closing the album out with “Lost on the River,” a cover of Hank Williams Sr.’s, Ottn sets the audience adrift, still wondering what is exactly happening. “Old sad yesterday/Words that you told me/Cut like a knife,” he wails in a dusty lo-fi recording. Maybe Ottn has never left that hotel room. What makes this album a triumph is the poetic imagery and banjo equivalence to endless layers of marshland and death. It is a beautiful album.